Shears are expertly hand-finished. Convex Edges so sharp that slide cutting wet or dry hair is a breeze. If you can appreciate fine quality hair cutting tools, this shear set is for you. These shears are expertly hand-finished. Convex Edges so sharp that slide cutting wet or dry hair is a breeze. The handle is very light-weight. 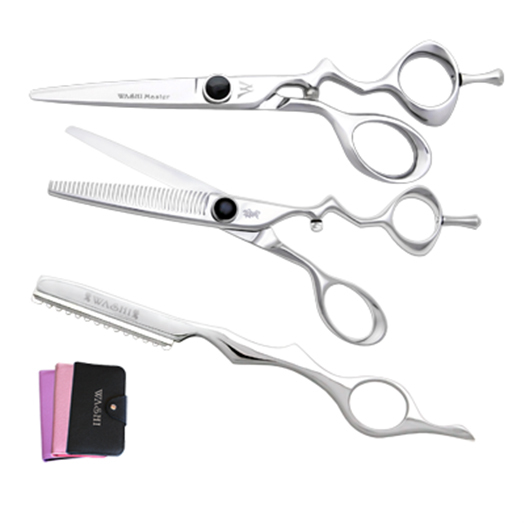 The blending shear features 35 softly curved, notched teeth for smooth gliding through hair. Removes about 40% of the hair. Forged from Authentic Japanese Hitachi Cobalt Steel. These scissors feature anatomically designed handle with bent thumb ring to give you the highest level of control and comfort!Set comes in a 5-pc case with a Silver Texture razor. Save over $100 by ordering a set!